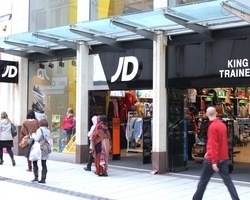 JD Sports is to open a chain of gyms as it announced plans to capitalise on the growing fitness market. The high-street retailer, which will open its first 21,000 sq ft gym in Hull next month, says it will be fitted out with the latest gym equipment. JD Gyms managing director Alan Peacock told the Hull Daily Mail that it was planning to open further gyms across the UK. Posted on January 23, 2014, in #retail, #uk. Bookmark the permalink. Leave a comment.